Each Retro Vinyl Roller Shade is made from durable 4-ply vinyl fiberglass material. Our retro roller shades offer a modern contemporary look to any decor. These contemporary roller shades are ideal for rooms in which you want easy functionality and impressive design. The retro vinyl roller shade is seamed if it is ordered both wider than 73" and longer than 60". The street side of the roller shades come with a white vinyl backing except for the color Eggshell, which is same color on both sides. Standard lift control is a continuous cord or upgrade to a cordless spring lift for child and pet safety. Each comes standard with a spring loaded lift mechanism when you buy Roller Shades online. W: 14" 15" 16" 17" 18" 19" 20" 21" 22" 23" 24" 25" 26" 27" 28" 29" 30" 31" 32" 33" 34" 35" 36" 37" 38" 39" 40" 41" 42" 43" 44" 45" 46" 47" 48" 49" 50" 51" 52" 53" 54" 55" 56" 57" 58" 59" 60" 61" 62" 63" 64" 65" 66" 67" 68" 69" 70" 71" 72" 73" 74" 75" 76" 77" 78" 79" 80" 81" 82" 83" 84" 85" 86" 87" 88" 89" 90" 91" 92" 93" 94" 95" 96" 97" 98" 99" 100" 101" 102" 103" 0/0"1/8"1/4"3/8"1/2"5/8"3/4"7/8" H: 12" 13" 14" 15" 16" 17" 18" 19" 20" 21" 22" 23" 24" 25" 26" 27" 28" 29" 30" 31" 32" 33" 34" 35" 36" 37" 38" 39" 40" 41" 42" 43" 44" 45" 46" 47" 48" 49" 50" 51" 52" 53" 54" 55" 56" 57" 58" 59" 60" 61" 62" 63" 64" 65" 66" 67" 68" 69" 70" 71" 72" 73" 74" 75" 76" 77" 78" 79" 80" 81" 82" 83" 84" 85" 86" 87" 88" 89" 90" 91" 92" 93" 94" 95" 96" 97" 98" 99" 100" 101" 102" 103" 104" 105" 106" 107" 108" 109" 110" 111" 112" 113" 114" 115" 116" 117" 118" 119" 120" 0/0"1/8"1/4"3/8"1/2"5/8"3/4"7/8"
can these be ceiling mounted? I need to cover sliding doors. Looking at the retro vinyl roller shades it looks like there isn't a valance. Is that right? Does it roll backwards? What is the warranty on the shades? Are they blackout? The retro vinyl roller shade does not come with a valance. For an upgrade charge, you are able to add a cassette head rail valance. You can get a standard roll or a reverse roll. A standard roll will roll towards the window and a reverse roll will roll towards the room. The warranty is limited lifetime, as long as you own the blinds. This will protect you against any manufacturers defects, but not normal wear and tear. They are blackout. But remember on roller shades, the fabric will be 1 1/2" smaller than the roll. Please keep that in mind when you order. 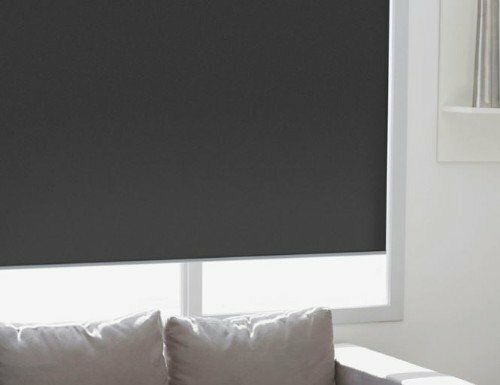 Are the Retro Vinyl Roller Shades room darkening? They are a room darkening roller shade. we are happy with the shades. we are happy with the shades. good quality product. the hangers were diff. than i had worked with in the past (not bad, just diff.) so i went to the instruction sheet to see if the spring was in the holder or the shade, to my surprise they were in spanish. it took some time to get them on line, but all went well. Good-quality vinyl dark green window shades. Good-quality vinyl dark green window shades. I would have preferred a fabric shade, but they are not easy to find now. So we went with high-quality vinyl, and the shades are fine. The shades were cut exactly as I had measured the windows, so no problem with hanging them. Nothing beats a dark-green window shade for keeping out the high intensity summer sun in the southern part of our country. Blinds were packaged very well. Blinds were packaged very well. Sizes were perfect. Hardware worked very good. I will be ordering more when I finish off another room. Thanks..
Nancy couldn't have been more pleasant or helpful. Nancy couldn't have been more pleasant or helpful. She answered all our questions competently and cheerfully sent us some samples. Our blind was perfect - exactly what we wanted and it arrived within a few days of our order. After having a bad experience with a big box store (which rhymes with Home Depot) who couldn't manage to get us a blind after months, I can tell you I will always order from Blind Chalet from now on...and only from Nancy.